Welcome to the third instalment of our review of the Devolo Home Control range. So far we have the starter pack up running with some additional motion detection and switching capabilities. We have tested many aspects of the myDevolo app, adding devices, creating groups, rules and scenes. We will now look at the safety and security applications as well as further software capabilities. One of the justifications for building a smart home is safety and security as well as convenience and energy efficiency. With the use of rules, groups and scenes it’s very easy to give the appearance that your property is occupied while you are away by turning lights and even appliances like a TV on and off, but more can be achieved. The Devolo Smoke Detector (Art No:09504) RRP £49.99 operates as a stand alone smoke detector. When it detects smoke it emits a loud warning tone via its piezo electric sounder and flashes the centre LED switch just like a regular battery powered detector. Its design means you have to put a battery in it before you can screw it up, we have seen headlines of a fire in a property that had a smoke alarm but no battery in it. Remove it from its base for too long and the alarm will go off, just like a tamper alarm. Unfortunate it doesn’t feedback the tamper status to the software. Anyone who has read one of the previous reviews will know what’s coming – adding devices to the Devolo network takes seconds. Start the add devices sequence, tell it which device you want to add, press a button and there you go. Once connected to the Z-Wave network it’s abilities are enhanced further. It can be integrated with the rest of the network, triggering lights to come on and send notifications via sms or email when an alarm is triggered through the appropriate set of rules and notifications. Current UK building regulations stipulate amongst other things that, a home should have at least one smoke detector on every floor, within 7.5m of each door, permanent AC mains powered, on their own circuit connected back to the consumer unit and be interlinked so when one goes off they all go off. With these requirements in mind this detector like many on the market with a battery power supply will not meet building regulations and could only be used to compliment an existing compliant smoke detector installation. It is a perfectly good smoke detector for retrofitting or for use in conjunction with an existing system. We tried to set up a rule so that when a smoke alarm was triggered that another detector would sound in tandem but the app does not allow you to put the smoke detector in the ‘Then’ part of the rules builder. I am sure Devolo have their reasons but it would be good to trigger all smoke detectors if one goes off in a similar way to hardwired and interlinked detectors work. It would also be useful if the sounder of the smoke detector could be used a part of an alarm setup. Set the system to an ‘away’ or ‘night’ mode and if any of the appropriate alarm sensors are triggered then the sounders emit a different warning tone to the one used in the event of a smoke alarm trigger. At present you need to buy an additional sounder. After initially setting up this device and before publishing Devolo issued a recall of the smoke detector as it has shown formal deficiencies with regard to European Standard EN14604. For this reason and as a precautionary measure they issued a recall. We were given an RMA number and prepaid postage. A replacement will be issued between July and August, so no exact date. The system has clear security applications as it can detect motion as well as opening doors and windows. The Devolo platform does appear reliable enough as so far it does everything when we expect it would. There are some missing features when compared to an existing or traditional alarm system and this can be said for the majority of Z-Wave devices. The test house has a conventional intruder alarm and we thought to compare and contrast the two. As mentioned in an earlier review of the sensors there is no tamper detection. A sensor could be interfered with without any indication. On the test house conventional alarm removal of a sensor device or opening its case will trigger an alarm. In the event of a power cut the hub loses all functionality whereas the test house alarm has a battery backup so the property remains protected and features like the auto-dialer and smoke detection still function. This problem may be overcome by adding a UPS to the hub and Internet routers and gateway to maintain the system and a connection to the outside world. The test house has two external siren/strobe units that will spring into life if triggered by the alarm. At the moment there is no comparable z-wave device we known about. It may be possible to integrate these by using a z-wave based low voltage relay and an input suitable for the external unit. The intruder alarm industry standards are set in documents PD6662 and EN50131. These govern the technical requirements for the design, installation and operation of alarm systems and their components. We have not come across any Z-Wave components that meet these standards. The cost of Z-Wave devices compared to traditional wired or even wireless components is higher. For comparison a quick search will turn up a Yale DIY wireless alarm with a telecommunication feature, bell box, dummy bell box, two PIR, two door contacts for £195 and adding a key fob, PIR or another door/window switch will cost £20 not they typical Z-Wave £50 device. Of course this is a stand alone system and you would be unable to leverage any type of home automation with it. A similar wired system from a reputable manufacturer costs even less. The test house has PIRs in every room and multiple door and window sensors. Some convergence in these technologies and standards will happen shortly, one imminent example is the Texecom Connect system which will allow a conventional security system to work with Z-Wave based components. We will have to wait to see what this means for the home automation market. Any Z-Wave security application should be described as a convenience rather than a replacement for a traditional system especially where mandated by insurance companies or where you would want to take a discount on your home insurance policy as a result of having a system installed and maintained. You have a choice of notification methods, SMS, email or push and you can set up one or multiple methods. You can use the Devolo SMS gateway but you will be limited to the number of SMS you can send and a journal of messages sent can be accessed through your profile settings. It’s not obvious how to buy a larger SMS entitlement so we used the online question tool but no different to previous occasions ‘No experts were on line’. We submitted a question and you need to add some more to a cart. It’s not obvious where this cart is but back on the myDevolo there is a link to ‘devolo shop’ but it is in German. You can also configure your own SMS gateway if you need to send more messages or have an existing account elsewhere. It is difficult to see where to add additional email addresses for notifying other people as all the notifications are tailored to the registered user of the system. Again we submitted a question and you need to add a ‘Sharer’ in the my Setting page. You enter an email address and an invite is sent to the new user. The new user needs to enter their name and date of birth and agree to the usual terms and conditions. Until the user registers they will show as pending on under the list of sharers. There is no obvious way to add additional mobile phone numbers or register additional devices. Once a notification is setup you next go to rules and setup a rule to trigger a notification, for example email the property owner when the front door is opened. One aspect to note is what appears to be the lengthy process to get to the information you need in the app. 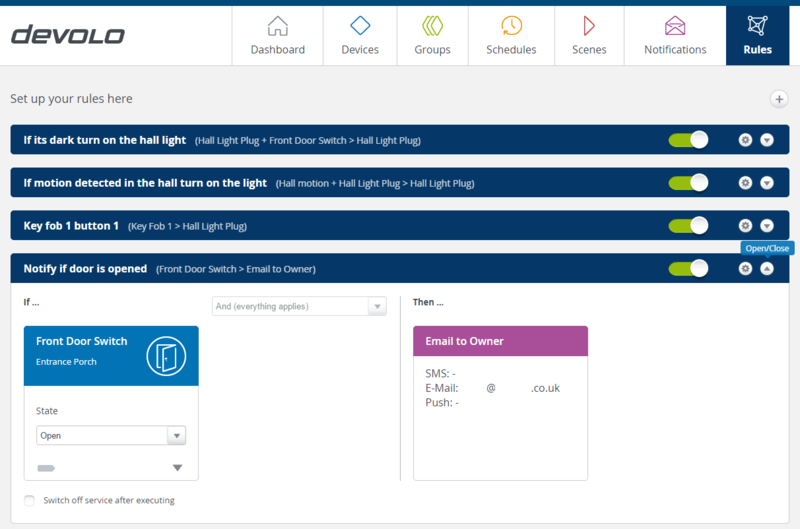 To illustrate, initial starting the app you are met with a Devolo splash screen, followed by a myDevolo screen where you select HomeControl, then on the next screen you select your HomeControl Hub and then you see your devices. Our experience is this can take between 20-30 seconds. Some of this will be due to device and Internet latency but we believe Devolo could remove a couple of the steps described above. The app appears to be a shell for a webpage specifically designed for the small screen as the same pages can be viewed in a desktop browser. When moving from one screen to another you frequently see a ‘Loading’ spinner and when going into a device an initial message flashes up ‘No widgets available! Please add widgets to the dashboard.’ Whilst disconcerting it quickly disappears once a spinner has rotated. On the app it is not possible to access the history graphs, a feature we think is missing. It’s probably best to describe the app as a basic viewer of the system as you have limited setup or editing functionality, for example you can on turn on/off an existing notification, you cannot set up a new one, you need to revert back to your desktop browser. Having used the some of the devices for some time one inescapable aspect is the latency. This is noticeable at night when the motion sensor is triggered to when the light comes on. It may only be a fractions of a second but it seems like much longer as you wait for the light to come on in a dark hallway Again there may be factors outside the systems control such as local network and internet traffic. The second piece of hardware we will look at in this instalment is the remote key fob (Art No: 9506 RRP £35). It’s a 4 button device no bigger than your typical garage door remote. Each of the 4 buttons can be programmed independently and you have multiple control choices, direct device control or trigger scenes. In our test house we used it to turn on the lights as a welcome home and to turn off the lights on the way out or going to bed. It is possible to see how this could find further uses with some additional hardware such as a low voltage relay, it could open electric gates and garage doors. Unfortunately Devolo have not added this capability to their hardware portfolio but it is available from other manufacturers. It’s been 7 weeks since we installed the door sensor and the motion sensor, we are pleased to say the battery life is reported as 100%. Considering these are in the busiest part of the test house this is a promising start. We will keep a track of this in our future instalments. The Smoke Detector has some technical conformity issues to resolve which Devolo have in hand. Unfortunately it is no replacement for your hard wired smoke detector. The inability to use it as an independent sounder or to use rules to trigger other detectors limits its flexibility. It’s a similar story with security, a Devolo system will not replace your existing alarm system and we believe this is true of the vast majority of Z-Wave devices and not just Devolo. The system may give you some additional remote visibility or reassurance and control of lighting when away from home but you need to program this. A great addition would be ‘holiday mode’ where the system would randomly switch different lights on and off to give the perception someone is at home. The key fob has lots of possibilities when combined with scenes, or other pieces of hardware. It has a great range, far better than the test house remote garage door or gate remote, so it would be worth exploring the real world interfaces such as the Z-Wave Fortrezz Interface/Bridge Module MIMOlite. There are areas of the software that are just not intuitive enough though and with no live chat and lack of tutorials/instructions it can make the user experience frustrating at times. It is good to see the FAQ is now available in English whereas it was in German in our first review. In the next instalment we will look at heating control and how to combine presence detection and actual room temperatures to improve comfort and reduce heating costs. 3 Comments on "Devolo Home Control Review Part 3 – Safety & Security"
Really very helpful article. Everyone understands the need for having a security system in place for both home & office. Thanks for nice information sharing. Devolo smoke detector is really big and mine gave false alarms. Replaced them with Fibaro one, very small, more functions, lot nicer design, and fully supported by devolo home control box. At the time of writing this review Devolo launched a recall of the smoke detector as it was non compliant to the necessary regulatory standards. Today we received the new replacement which is now EN14604 certified.